Is your organization doing as well as it could? How do you know? What should you change? How do you decide? We can help you answer these questions. Used by organizations and performance improvement professionals around the globe, the Baldrige Performance Excellence Framework offers an opportunity to evaluate your organization's current level of performance maturity based on more than 25 years of the Department of Commerce's National Institute of Standard's research across six process oriented categories relative to the results achieved. 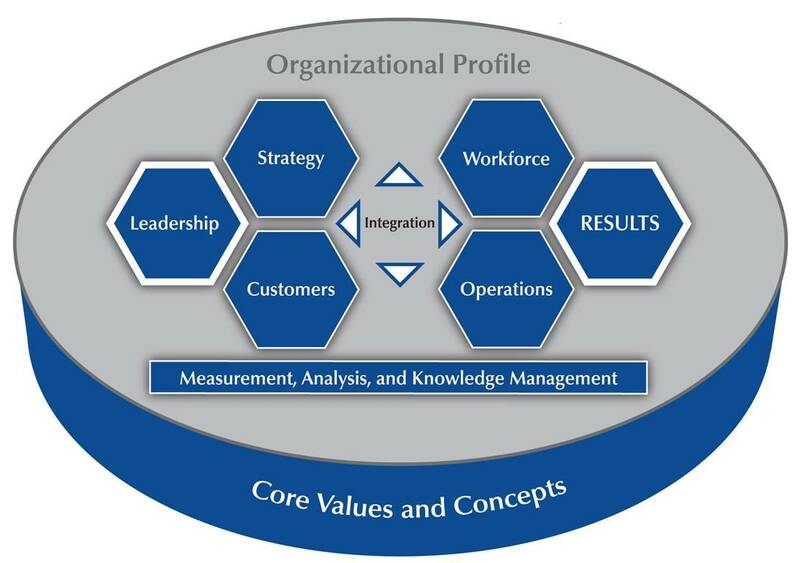 Updated every two years, the Baldrige Framework is the only methodology that provides a holistic look at performance. At this one-day workshop you will learn how the Baldrige Excellence Framework can guide your efforts to assess and improve performance in your organization. You will learn how mature performance in six Process oriented categories drive measurably mature Results. The Baldrige Framework applies to organizations large and small and includes Business, Government and Non-Profits, as well as Healthcare and Education. Organization Leaders: those executives, managers, supervisors, coaches and workforce development professionals in search of new performance assessment and improvement methods focused on the need for mature processes to drive measureable results. Process Improvement Professionals: those professionals seeking a structured approach that brings context to focused improvement initiatives in the areas of risk, innovation, strategy, quality, process improvement, efficiency, customer engagement, workforce engagement and more. For many professional disciplines, attendance counts toward recertification. As an example, for the American Society for Quality, attendance here is eligible for 1.6 recertification units. Look to your discipline to determine if your attendance can help your career. Award Applicants: those representatives of organizations looking to apply for the US Senate Productivity and Quality Award for Virginia & the District of Columbia and perhaps the National Baldrige Award. Discovery Participants: those representatives of organizations interested in participating in the Virginia SPQA Discovery Self-Assessment Program that provides structured feedback. Award Examiners: those who want to fulfill the continuing Baldrige Excellence Framework training requirement to become a volunteer Virginia SPQA Examiner and by definition add to a resume. Virginia SPQA Facilitators bring many years of experience using the Baldrige Criteria in organizational self-assessment, award application preparation, and/or award application evaluation. They will lead workshop participants in detailed discussions of the seven categories and will help attendees learn to identify critical success factors for their organizations.